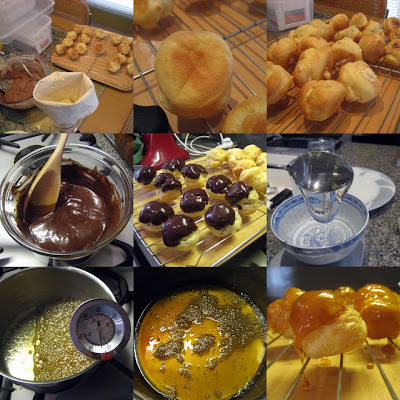 I spent 5 hours on Monday doing a practice mini-Croquembouche as a trial run for my mother's birthday cake. You're making her a croq-em-what now? Croquembouche is the traditional cake for French weddings and christenings and is made of a conical tower of choux puffs filled with crème pâtissière, glued together and glazed with crunchy caramel. The name means "crunch in the mouth". The French name for the Cookie Monster (as seen on my blog header) is "Croque Croque", don't you know. Ok, I get it. Why on earth are you making it? I've never made a croquembouche before, and in fact, when I was a kid and we went to family dinners or parties, I'd always be disappointed if the dessert turned out to be a croquembouche. I'd always be hanging out for a something decadent, rich and chocolatey. Black forest cake, fondues, chocolate mud cake, that sort of thing. However, I think that a croquembouche will be completely appropriate, if I can pull it off. They look impressive, functioning as decoration AND delectation. The majority of guests will be my mum's friends and family - Malaysians love choux balls and crème pâtissière. (We just call them cream puffs back home). I think that after a big night of eating and drinking, most people will only want something small and sweet to signal an end to the eating. Furthermore, croquembouches are ridiculously expensive at patisseries, so being able to make my own will be a good skill to have. At one particular cake shop, I saw a sign for their croquembouche: "Price on application. We recommend 2 balls per person". HAH! How could I not make a cake with such ripe opportunity for innuendo? That's a lot of balls. What recipe are you using? I started off with a long series of back-and-forth emails between myself and my friend Lisa, an experienced croquembouchière (not a real word), for advice. After that invaluable advice, and much googling, I decided to use the Roux Brothers' classic recipe, but do half classique, half chocolat, and try to get a funky spiral effect happening. However, I don't think that the specific recipe is that important. Choux pastry and crème pâtissière and caramel are staples of French pâtisserie, widely available in cookbooks or online. Rather, the assembly and presentation of a croquembouche are the deal breakers. Enough talk. Show me some photos! Choux pastry itself is easy enough to make, but I found the piping a bit of a challenge. See those weird nipply shapes in the centre of the above photos? Oh dear. I smoothed them out with a wet spoon to get a round shape. Not perfect, obviously, but better. For baking, the Roux Bros' recipe said to keep the oven door ajar after the first 5 minutes. It seemed like a waste of energy (the oven's, not mine), but they turned out nicely in the end. Does anyone know why you'd need to keep the oven ajar? I have to say, it felt like a huge accomplishment pulling my own tray of choux puffs out of the oven. They smell delicious, and look very cute. I had to break one open to see what they were like on the inside. Aah! They're hollow on the inside so you can fill them with cream! Making crème pâtissière is similar to making what I would call a regular custard (a crème anglaise, appropriately enough). For regular custard, you'd beat egg yolks and sugar, pour hot milk over them, and then cook the mixture on a low heat until thickened. With crème pâtissière, there's slightly less pressure. There's flour in the mixture, you see, which stabilises the egg yolks and makes them less likely to curdle over heat. So live on the edge, and cook it until nice and thick. After all, soggy custard will make soggy balls, and no-one wants soggy balls. I made one batch of crème pâtissière and divided it in half. I turned one half into chocolate crème pâtissière by adding finely chopped chocolate (a Gabriel Gaté tip). For both the chocolate and the vanilla crèmes, I folded in some whipped cream to lighten them. (Half the volume of unwhipped cream to crème pâtissière). I love a good whisk shot. 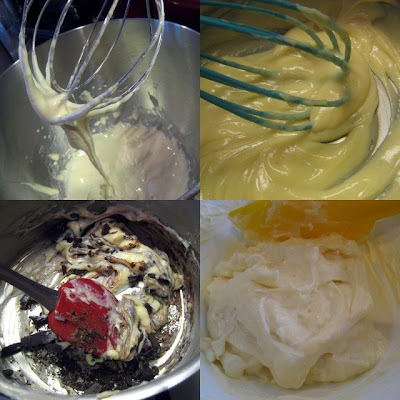 Clockwise from top left: the beaten egg-sugar-flour mixture. The vanilla crème pâtissière. The "light vanilla crème pâtissière". Making the "chocolate crème pâtissière". Injecting choux-puffs with cream is fun! You make a little hole in the base of the puff with a small knife or chopstick, then pipe the cream through the hole. I covered the chocolate-filled ones with a chocolate ganache. Making the caramel (water, sugar and glucose) was surprisingly not nerve wracking - I had a thermometer, which told me when my caramel was at the hard crack stage. It took about 15 minutes. Dipping the choux puffs in caramel wasn't too bad, but it was sticky. I used 2 pairs of tongs to avoid burns which progressively got stickier and stickier. Still, it was not impossible, and I managed to coat all the balls. You need to let the caramel cool completely and get hard before assembling the balls. Don't put them in the fridge, or they'll go soggy. Remember what I said about soggy balls! The next step is to assemble your balls. Many recipes call for a conical mould, but for this practice run, I just did it free-form, glueing the balls to one another with more caramel. Lisa says that a mould is unnecessary, if you keep building progressively inwards, but as we can tell from my wonky attempt, I'm definitely going to need some sort of mould or guide to help. One more ball and it would have been a complete pyramid! If only I hadn't broken open that first one. Argh... what a messy day. The most rewarding part of the whole exercise? The taste test! We had a few with coffee in the afternoon, and later in the evening, I took some round to my friend Georgina's place to get an outside opinion. - Croquembouche is a good birthday cake! - The balls can be made a week in advance and frozen, then I'll defrost and fill them on the day. - The classic vanilla/caramel balls are delicious! My family loved them, especially my mother. The thin and crackly caramel coating provides a delicious contrast to the balls. - We weren't so keen on the chocolate ones, finding them a bit bitter and rich. - My friend George loved the chocolate ones! Go figure. - A ganache topping is not a good idea, as it melts too easily in contact with the hot caramel, gets fingerprints in it, and provides no texture contrast. If I choose to continue with the half vanilla/half chocolate balls, I'll cover them with plain melted chocolate. - I will definitely need a mould of some sort, especially if I want attractive contrasting spirals happening. I do. - The caramel has a small window of opportunity where it's perfect for use. Left too long it gets hard and will break the roof of your mouth, especially the thicker caramel glue between the balls. I will make it in 2 batches - one for the coating, one for the gluing. Mmm that looks impressive and delicious Sarah. I'm sure it will make an excellent birthday cake. This is a great pictorial guide, Sarah. And sounds like a fair bit of fun too:) I'm wondering if the caramel needs to be that hard? I know it should be very hard if you're going to, say, do strands of sugar around a croquembouche, but if it's intended to be bitten into, maybe a softer caramel is easier? Dunno. Oven ajar: It can be to rapidly drop the temperature above the baked goods (eg, to stop burning/browning on top while still giving lift from the bottom), or to reduce humidity in the oven. There might be other reasons too. Oh and I meant to say you sure like playing with those balls don't you! Oooh! I've made choux puffs before and have considered making a croquembouche but to tell you the truth, I'm just too lazy. :) Looking forward to seeing the final version! Looks great! I would use one of those styrofoam cone bases you get at the cooking supply shop. That way you can build a nice spirally croque and plus you don't get any squashed ones at the bottom of the pile! Great post Sarah. I like this series you're doing on your mum's birthday party. I feel like I'm part of the preparation team and it's very exciting to see your experimentation. Profiteroles is something that's on my list to make for a while now, but I'm a bit scared to make them. They seem really hard to make so usually I take the easy option of making the Supermarket boxed ones, but those don't taste as good. I'm worried about the choux pastry part. Can you point me to a good choux pasty and creme patissiere recipe? I know I can google them, but I don't know which ones will work and importantly, which one taste good. The croquembouche looks great. I've seen them at many cake shops too, and they're unbelievably expensive. In fact, they're not even as good as yours as most forgo the caramel and just use chocolate completely, which is easier to do. Oh, I just Googled creme pastissiere and it's called pastry cream. It never clicked that those are the same thing, duh. Anyway, I've made a pastry cream before, so I can do that part. I just need to find a good choux pastry recipe. At a patisserie i used to work in they would roll half their choux puffs (already dipped in caramel) in pearl or hail sugar. Might be nice if you can find some and you want to get a nice spiral pattern going without using chocolate. Wow!!! 12 comments in one day. That's huge for me! Yay. F - I was thinking little red candied flowers in between the puffs. Red's my mum's favourite colour, and it will look less wedding-like. Wes - Thanks!!! I'm guessing that you vote for chocolate puffs! Hehe. Duncan - Thank-you! I found that the caramel actually coating the balls was deliciously crackly, whereas it was just the thick pools of caramel glue between the balls were on the hard side. :S I was happy to pick them off, but I'll try to be more careful when I do the real thing. Thanks for the oven info too. Agnes - Thank-you. 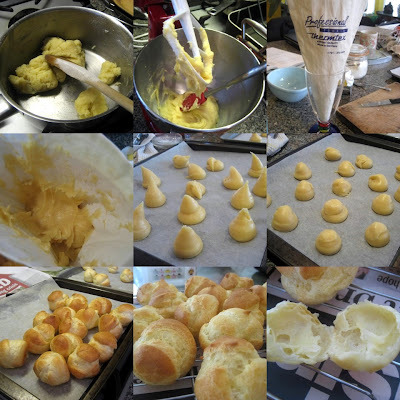 Making choux puffs is great fun, isn't it! Pinky - Thanks for the tip. I went to a cake decorating shop today, but could only find metal moulds. I think I'll call around a bit to see if I can find a big styrofoam one. Failing that I could make a bit cardboard one. I think most choux pastry recipes from a reliable source would work well. The recipe is actually quite simple, and fun to make if you've got some spare time. I can email you the Roux brothers' one if you want? It worked for me! Re: store-bought croquembouches, it's hard to find a good one. Even the ones at Brunetti don't look great. I love their cakes in general, but their croquembouches are covered in such a thick layer of chocolate that it doesn't look like a croquembouche anymore..
Zoe - thank-you for the idea! I'm still debating chocolate or no chocolate, so the pearl sugar would be a great alternative if I'm going pure caramel. Sandra - Werklich, ich bin berühmt in Deutschland? Das ist sehr toll! Ich kann das neue "D.S.D.K" sein. Was heisst 'K'? Köchin, naturllich! Hehehe. Dein Tante ist sehr nette. Loved your post Sarah, I am curious, how long did this take to make? I am sure your family appreciated all of your effort! I just found your blog and I will bookmark the URL to read of your future adventures. Happy days! Sarah, if you can email me the choux recipe, I'd be greatful. You can email me at ieatblog[at]yahoo[dot]com. I was thinking of the Brunetti croquembouche when I said how some shops cover them entirely in chocolate. I think your caramel one would be far superior. They sell theirs for like $70 for about 20 balls from memory. That's really expensive. A few years ago a friend had a croq cake for her wedding with sparklers. It was far more impressive than a normal wedding cake. I think the door ajar thing is about reducing the temperature. A lot of chefs cook at lower temperatures than you may expect. A friend who is a chef taught my mum to leave meringues in the oven overnight at the lowest temperature with the door open to get the crispiest whitest result. Anonymous - Thank-you! It took me about 5 hours in total. I'm going to split up the workload for the real croquembouche though... and make it fours times the size, lol. Ed - Yeah, I was having a walk around Cake Deco the other day looking at their sparklers, candles, sugar flowers etc. They have such cool stuff! Aah.. now I get it about the meringues. Whenever I make meringues or pavs, they're always a bit brown. I'll try the overnight thing and see how it goes next time. I made one for my husband's thirtieth - I also spun some of the sugar around to top it off basically you just get a fork and trail it back and forth between two handles if you can imagine that. Also at the base of the croc I put lots of ferrero rochers and other glittery choccies so it looked quite showy and glam when I dropped it off at the restaurant they asked me for my business card - so it was quite impressive! Wow - the croquembouche looks amazing, good luck when making the real thing! i made a croquembouche not to long ago and instead of filling the little balls wit that rich strong chocolate filling i made a light and fluffy chocolate mousse to fill the with. Very tasty! hi, these look gorgeous, would you be able to send me the Roux brothers recipe for the choux as well? Thanks! Hi Sarah. I found your blog while googling 'croquembouche in Melbourne' for my 40th birthday. You have inspired me to make my own birthday cake rather than me being disappointed in a store bought one (not to mention the cost..). Thanks.